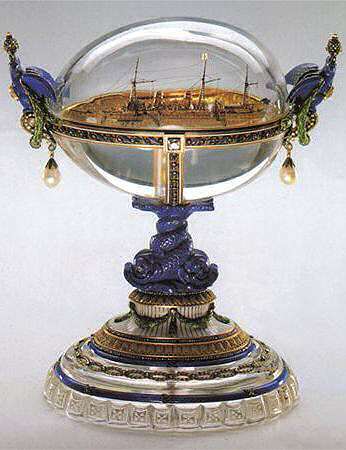 The 1909 Standart Egg, also known as Standart Yacht Egg, is made of gold, diamonds, rose-cut diamonds, pearls, lapis lazuli, rock crystal and green and white enamel. 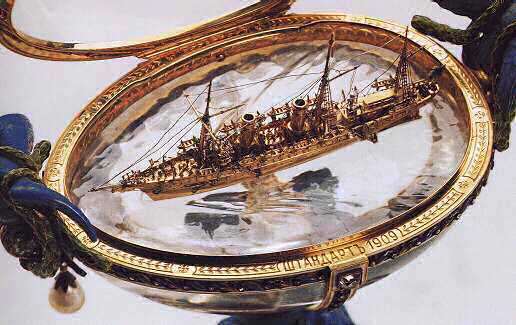 The miniature yacht is made of gold, platinum and enamel. 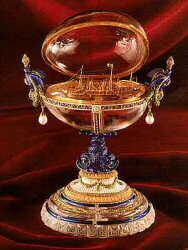 The crystal Egg is horizontally mounted in gold and bears the inscription "Standart 1909" on the edge of the mount. A gold band, with inlaid leaves of green enamel and small diamonds, lines the perimeter of the egg. The bottom half of the Egg is decorated with a vertical gold band with inlaid designs. 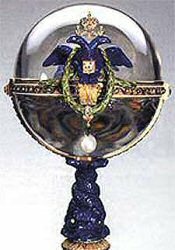 A crowned eagle of lapis lazuli is perched on either side of the Egg; a pear-shaped pearl hangs from each of them. 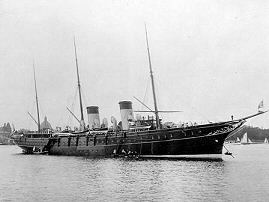 The shaft consists of two lapis lazuli dolphins with intertwined tails. The oval base is of rock crystal with a wide band of white enamel inlaid with laurel garlands and bands of small diamonds with laurel branches in green enamel. An exact replica in gold of the yacht Standart rests inside the Egg on an oval base of rock crystal representing the sea. 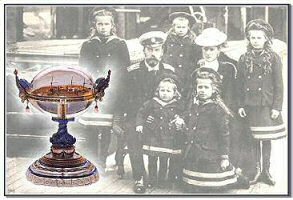 The 1909 Standart Egg was never sold and is one of the ten Imperial Easter Eggs in the Kremlin Armoury Museum in Moscow. 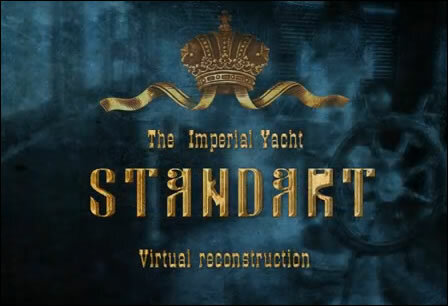 A very nice movie of a virtual reconstructed Standart can be seen here: http://youtu.be/i5MPb21B_3I.